I know what your thinking, “do we really need another subwoofer”? But what makes the Mille 8 inch subwoofer different? With most amplifiers getting smaller and smaller in the past three years, nothing has really changed with subwoofers. As we have covered in previous blog posts, flat subwoofer or “shallow” woofers have been a solution for small space vehicles. The issue with shallow woofers is a low excursion. This means it is hard to hit the real low bass notes. This is just how shallow woofers are designed, but they certainly have their applications. 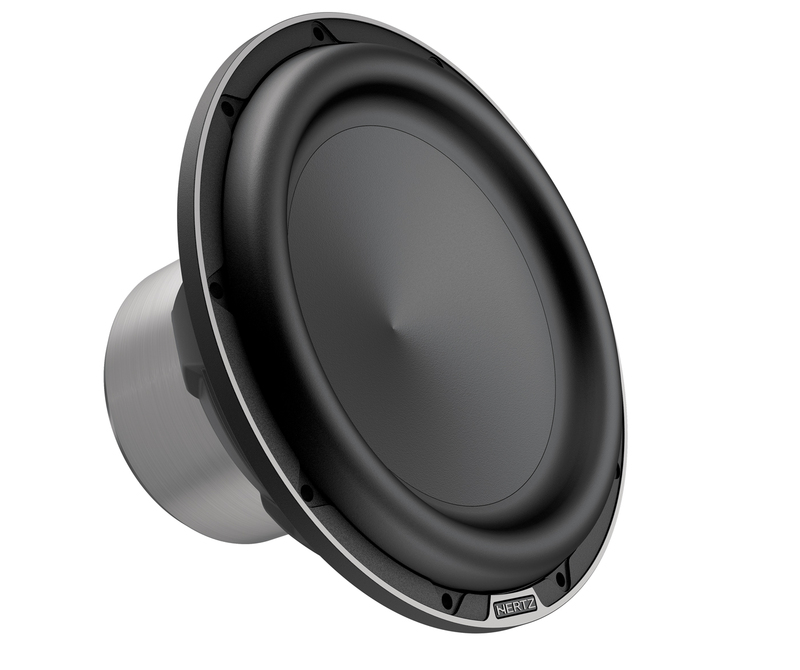 Hertz launched their first redesigned and re-engineered eight-inch subwoofer. The ML 2000.3 Legend series subwoofer is designed to reproduce low bass in enclosures of 0.4 – 0.9 cubic feet! This is incredibly small by most manufacture’s standards. This opens up endless possibilities with traditional MDF or fiberglass enclosures. Extraordinary large neodymium magnet, optimized for FEA simulations, to ensure magnetic field stability even under high excursion. Very low carbon content CNC machined plates, for maximum magnetic permeability and low distortion at high power levels. Voice coil internal magnet with high size/performance ratio, for maximum efficiency. CCAW, 100 mm (4”) voice coil, capable of handling 1400 W musical power, keeping the working temperature very low, reducing dynamic compression to the minimum. Voice coil wound with In/Out method, for even cooling of the different coil layers. 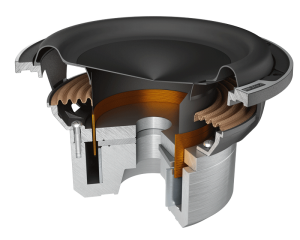 Voice coil wound on TIL former: this material made from fiberglass combines the heat dissipation properties of aluminum with the stiffness of Polyamide composites, for a no-compromise acoustic performance. Central pole featuring “Aluminum Shorting Ring”, for minimum distortion and maximum extension at low frequency. 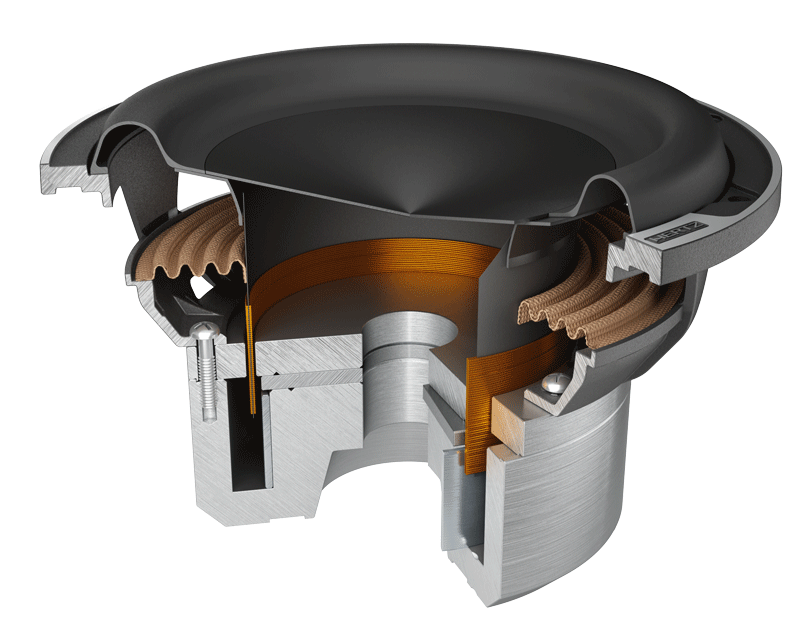 “Boundary Free” IIR rubber surround, for higher SPL performance than other subwoofers with same external diameter. Exponential V-cone® with optimized geometry for high cone stiffness and strong resistance to deformation even at maximum excursions. Mineral-injected paper cone, for superior rigidity and damping. Very acoustically transparent anti-resonant aluminum alloy basket featuring six-spoke self-standing structure and built-in venting holes underneath the spider. CNC machined elegant diamond-cut basket edge featuring the Hertz logo. Ergonomic, ultra-compact design, with an array of electro-acoustic parameters optimized for sealed box application with 10 – 17 litre volume. This woofer is worth a look…we really recommend this woofer for those tight spaces where you would love to add high-performance low bass to your vehicle.